Confession: It's taken me the better part of an entire year to get this post up, but I'm a firm believer in "better late than never," so alas, here we are. I'd like to start off with an unrelated side note about my life lately. It's been, well, kinda cray. I'm transitioning between jobs, focusing on my physical and mental wellness, and learning how to maintain meaningful relationships with my partner, friends, and family. I'm also (somehow) juggling a budding career as a freelance journalist, which is incredibly exciting but also incredibly time-consuming. I'm figuring out how Rivas Raves fits into the equation, so I appreciate you — yes, YOU — for sticking with me during this chaotic time. I may not have hundreds of thousands or millions of followers, but that isn't why I started my blog. It was always about having a creative outlet that truly resonated with and reached people — even if it's just one person, that's all that matters! OK. Now we can resume our regularly scheduled programming. So... Positano, Italia. Oh, where to begin? It's a wondrous, magical place. I'd heard so much about Positano leading up to my trip there last October. I'd seen A-list bloggers trekking along the beaches and cobblestone streets, eating gelato, drinking wine, generally living their fullest and best lives, and I thought to myself: I must experience that. The food! The music! The people! The views! It really is all they say and more. 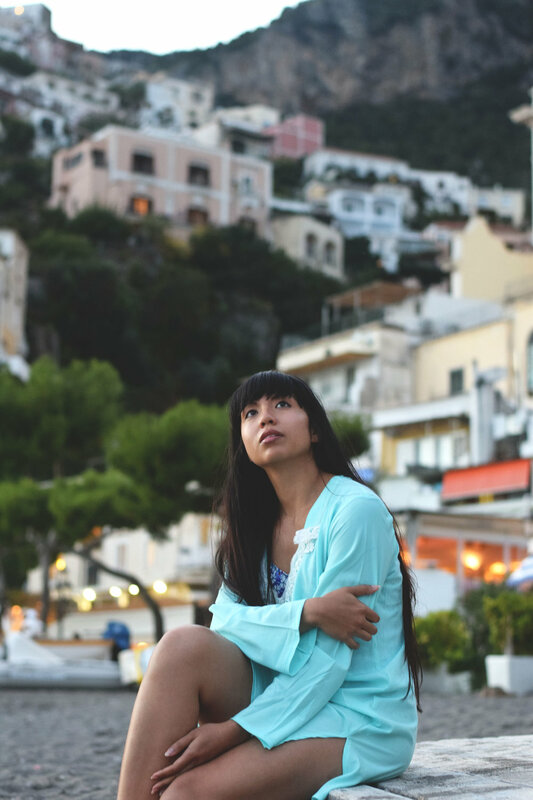 We ventured to Positano right as the summer vacation season was coming to an end, which I highly recommend to avoid overcrowded beaches and streets. Although we arrived in late October, it was still warm enough to hang out along the water and wade in the Mediterranean Sea. I'd truly never experienced a place that felt so calming and peaceful. The story behind this look is one for the books. Since we were vacationing at the end of the season, I hadn't packed a swimsuit because I didn't think we'd spend any time at the water. But with unexpectedly warm temps, I couldn't not take advantage of the beach, right? Fortunately, I scooped up a blue floral print one-piece swimsuit and this pretty seafoam green cover-up at a local boutique. As an added bonus, both items were on sale — score! It ended up being the perfect ensemble for some impromptu beachside frolicking. And that's just one of the many reasons why I'm convinced that Positano is actually heaven on earth.